The Series 610 Low Differential Pressure Transmitters are capable of measuring the pressures and flow of air or non-conducting gases at high resolutions. Designed specifically for clean rooms, isolation rooms, and other critical environments, the Series 610 uses an improved all stainless steel micro-tig welded sensor to detect differential pressure and convert this pressure into a linear DC electrical signal by a unique electrical circuit. This unit is ideal for situations when accurate and reliable pressure monitoring is essential. Easy access pressure ports and electrical connections, removable process heads, and detachable terminal blocks make for fast and easy installation. 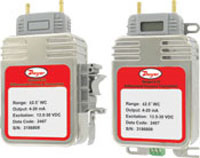 The Series 610 transmitters are available for air pressure ranges as low as 0.1" w.c. full scale. Standard accuracy is ±0.25% full scale (terminal-based) in normal ambient temperature environments. The tensioned sensor allows up to 2 psi overpressure in either direction with absolutely no damage to the unit. The Series 610 transmitters can be ordered as either a base mount or a din rail mount and the option of a digital read out display. In addition, a calibration key can be ordered that allows the user to set zero and span. One key will work on multiple transmitters. Service: Air or similar non-conducting gases. Accuracy: ±0.25% or ±0.5% F.S. Temperature Limits: -20 to 160°F (-29 to 71°C). Pressure Limits: 2 psi (0.137 bar). Power Requirements: 13.5 to 30 VDC. Output: 4 to 20 mA. Loop Resistance: 800 ohms max. Zero and Span Adjustments: External security key pendant. Response Time: 0.02 to 0.04 seconds. Electrical Connections: Detachable screw terminal connector. Process Connections: 3/16" O.D. barbed brass fittings on removable process head. Enclosure Rating: Fire retardant ABS. Weight: 9 oz (255 g). A-616 - Process Head without Display. A-617 - Process Head with Display. A-465 - Flush mount space pressure sensor. A-301 - Static pressure tip, for 1/4" metal tubing connection. A-302 - Static pressure tip, for 3/16" and 1/8" ID plastic or rubber tubing. A-303 - Portable static pressure tip, for 3/16" ID rubber or plastic tubing with 4" insertion. A-414 - 316 SS clean room pressure sensor. A-307 - Static pressure fitting, for 1/4" metal tubing connection. A-308 - Static pressure fitting, for 3/16" and 1/8" ID plastic or rubber tubing. A-417 - Static pressure pickup, for use in clean rooms, 100 micron filter picks up static pressure, stainless steel wall plate fits 2" x 4" electrical box, sealed with foam gasket, screws included. Barbed brass fitting holds 1/8" to 5/32" ID tubing. A-418 - Static pressure pickup, room mount with Delta style plastic enclosure fits 2" x 4" electrical box, mesh screen hides static pressure pickup port, clean connection to 1/8" to 5/32" ID tubing and pressure sensor. Sealed with foam gasket, screws included. A-419 - Static pressure pickup ceiling mount, plate rests on top of standard 3/4" thick ceiling tile while 100 micron filter faces down through 5/8" hole in tile, screws included for optional mounting to junction box, barbed fitting holds 1/8" to 5/32" ID tubing. A-420 - Static pressure pickup for roof/outside mount, NEMA 4X (IP66) rated structure withstands harsh environmental elements, structure is 3-5/8" across and 2-1/2" deep, EMT conduit fitting is 1/2", pressure connection is brass barbed fitting for 1/4" tubing. A-306-A - Outdoor static pressure sensor, provides average outdoor pressure signal for reference in building pressurization applications, includes sensor, 50 ft vinyl tubing, mounting bracket and hardware. A-201 - Rubber tubing, 3/16" ID, 9 ft length. A-202 - Rubber tubing, 3/16" ID, lengths to 50 ft, per ft.
A-203 - PVC tubing, 1/8" ID x 1/4" OD, per ft.
A-210 - Aluminum tubing, 1/4" OD, 5 ft length, 500 psi maximum pressure @ 200°F. A-211 - Aluminum tubing, 1/4" OD, 50 ft length, 500 psi maximum pressure @ 200°F. A-220 - Flexible vinyl tubing, clear 3/16" ID x 5/16" OD, lengths to 500 ft, per ft, 45 psi maximum pressure @ 73°F. A-221 - Flexible vinyl tubing, clear 1/8" ID x 3/16" OD, lengths to 500 ft, per ft, 40 psi maximum pressure @ 165°F. A-222 - Flexible vinyl tubing, clear .240" ID x .375" OD, lengths to 500 ft, per ft, 35 psi maximum pressure @ 73°F. A-223 - Black polyethylene 1/8" ID 1/4" OD, 10 ft length, 200 psi maximum @ 140°F.